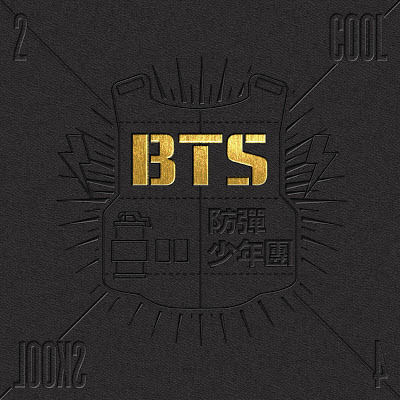 For now I'll focus on their first single album "2 Cool 4 Skool"
While I do love this song and I love the dancing in the video, the rest of the MV was a little odd . . . The group as a whole looked great, but their individual shots ::tisk tisk:: whoever decided it was ok to place the boys in overtly large American Football gear, and hats that have flashlights attached to them should be shot. That music video, it was amazing. It doesn’t suit hyung, huh? Hey, the bell rang - let’s go! J-Hope: Unlike everyone who raps, I was practicing my dancing! (Of course you were!) (Right~) (Oh, natural dancing skills?) I bet Jimin was doing the same! Rap Monster: Taehyung, what was your dream? V: I played the saxophone for three years. (But why don’t you do it anymore?) Ah . . . because my mouth hurts. (Your mouth hurt?) (Yeah, your mouth must hurt.) (You’re really hypocritical, yeah.) (Your mouth must have hurt a lot.) (You’ve got a brilliant mouth.) (My heart hurts [hearing that]). Rap Monster: Our Jin hyung, what did you do? Rap Monster: Jungkook, what was your dream? Jungkook: Me? Ah . . . I can’t remember that well . . .
** Note: Some parts have been omitted or many not be translated 100% accurately as there are no lyrics are available, both online and in the physical album. Another awesome track. The boys really do know what they're doing for a rookie group. The beats really draw you into the song, their dancing (in the MV) is, once again, spot on . . . plus its extremely fun to sing along with. One thing you should really take note of, is Rap Monster's English . . . if my understanding is correct, he taught himself. This is extremely fascinating to me because its really, reeealy hard to hear an accent from him. It's Hallyu law . . . every album, regardless of its specific genre, must contain a ballad-ish like song . . . and BTS is no different. Its a good song, easy to listen to and it has a sort of Jazzy feel to it. Which is vastly different from the rest of the album and it shows their ability to branch out into different forms of music, and I respect them for that. But I personally find my self drawn to the faster paced songs so I'm only giving this 4/5 since I need to be in the mood for this style of song. Ok, even I . . . who is not very knowledgeable about the Kpop inter-workings, let alone the music industry in general, can hear the pure talent rolling off these boys during this free style rap section. The boys are obviously having fun with this whole concept, and its a nice look into how they bounce raps off each other. Once again, thank God for the internet!!! for I have found yet another kind soul who translated what they are saying into English. Rap Monster: I'll give you 500 won, come back with 500 won aight . Rap Monster: Let's enjoy same day! Tiresome same beat! Others: Alright, alright, let's give it a listen. Jimin: We'll see how well you've recorded it . Rap Monster: I'mma hit it! I'mma hit it! Suga: Not bad, huh? How about a cypher, it's been a while. Suga: It's been a while, we're going straight on with cypher, let's make it big, shall we? Rap Monster: Hyung first, hyung fisrt! Suga: Yo- alright then we'll start with me. BTS: Go Suga! Go Suga! Suga: My name is S-U-G-A. Other rappers are all behind me. Same as always. I tease my tongue this way and that over this beat - all your rap makes me sleepy. Shall we rewind the CD? Our music makes the women cry. Our name is Bangtan. What's coming out of your mouth right now is . . . exclamation ? Rap Monster: I'm a cool boy, I'm a nice boy. But my voice is low. You're a kid next door. And I am Satan. I'm a Igatan that heals you. You can do rap. I do it well. You are ribbon pig. I do it with my feet. Both arms thugged out with public school Rolex, ugly glasses - All words that suit me. But for you tacky/trashy or Pompeii. You just erupted, cover up those mountains. Wait guys I need to pee. BTS: Go Jung Kook! Go Jung Kook! Suga: Who's next ? Who's next ? V: Should I do it ? Then I'll go Cypher . V: Alright, so I heard the hyungs' rap well. Namjoon hyungs' lyrics, he's all mature now. Their rap skills are nearly back to back. It's compliment, now quit it. Hobi hyung in front of me, he's getting tense now. What's making you nervous? Go make us some kimchi. Daegu dialect, it's aliv! Yoongi hyung, you alive, son . J-Hope: Now the J-Hope has to come forth. J-Hope, J-Hope's coming out! J-Hope: It's skill in our music. I'll show you my blade-like skill. My my my name is J-Hope ! I'm so handsome/cool. I don't even leave a trace. I'm the hip hop that Gwangju gave birth to. This is the start to Jeolla-do's rap. I'll shake you up go burst. Because we're really smashing. BTS: Go march! Go march! Jin: My name is . . . Jin I'm the most handsome. My nickname Jindda. Keep shaking your books you'll fall out chyyyyyeaaa. Rap Monster: And then what? Jin: So my nickname is Jin . . . So my stage name is Jin. Rap Monster: Who's left? Did Jimin go ? Jimin: Shall I show you ? My name is . . . Jimin. My rap makes the vocal team here wet their pants. Tae-hyung please get up, you smell a little fishy. Look me up in advance. BTS: Leave(3x) What even was that . . .
Rap Monster: Go migrate somewhere. Jimin: I'm sorry . . I . . I Won't do it again. Suga: I don't think you should rap,man. Suga: Okay, now that our cypher's over . . how about we go out and eat? Rap Monster: A night outing. Jong Kook: Lobster soondae. Let's go eat soondae. Suga: Let's go ! I'll treat you all! Rap Monster: I get sick, I'm not gonna eat any. Suga: Alright then, happy working. Jong Kook: I'm going. Bye! Rap Monster: Really now . . . This is too much . .
Jin: Stay put . .